Stephanie at Angelic Accents is having her annual To Have And To Hold Wedding Blog Party and I thought it would be fun to re-post about our wedding in Venice. We are leaving for Venice this August for our 2nd honeymoon . I am so excited to be visiting this beautiful place again and I’ll be back soon to tell you the details of our upcoming trip. 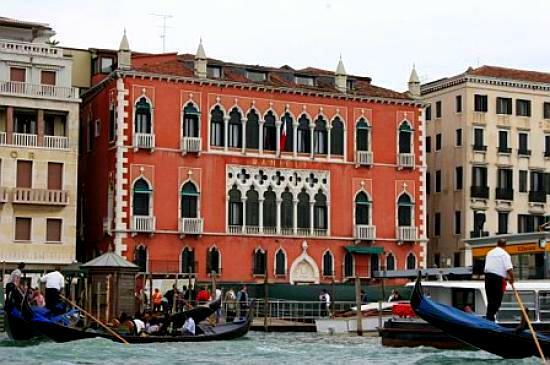 This is the Palazzo Dandola where we were married on the rooftop terrace overlooking the Grand Canal. 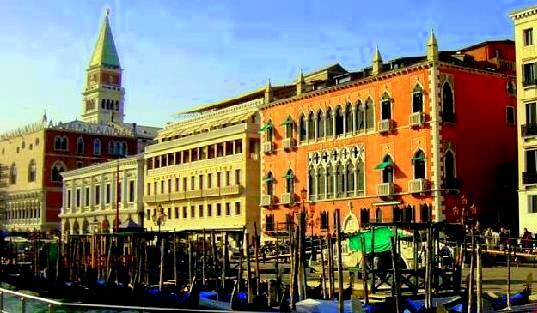 The palazzo dates back to the 14th century and is just steps from Piazza San Marco. It is now the magnificent Hotel Danieli. Sorry about the poor quality of these scanned pictures. These were taken before digital cameras were popular. The view of the Grand Canal and the island of San Giorgia was magnificent. After the ceremony we stepped out the door of the Danieli to pose for more pictures. All of a sudden there were dozens of people surrounding us. Several sweet Italian ladies came up to touch my dress and say congratulations. One even gave me a kiss on the cheek. They were applauding and cheering for us and by the time we walked to the gondola we had a quite a crowd following us and tourist running to take our picture. One poor lady almost fell off the pier trying to take our picture. 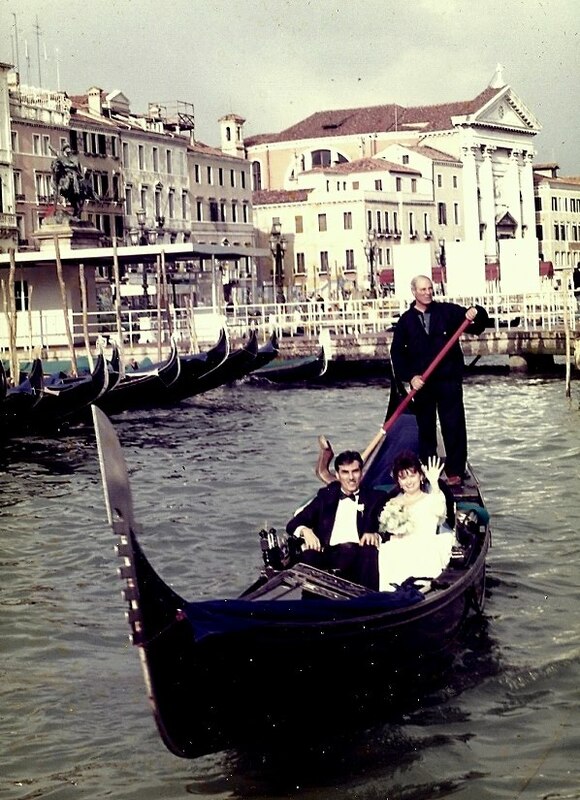 It is a tradition in Venice for the bride and groom to ride a gondola through the canals after the ceremony.I can’t tell you how nervous I was about stepping into the gondola in my wedding gown and heels. I had this vision of landing in the water and my gown floating above my head! As we rode through the Venice canals hundreds of people gathered on the bridges and sidewalks and yelled their best wishes in many different languages. When we replied to thank them you could hear shouts of “Americana’s”. I guess people thought they had encountered an Italian wedding. Boy, were they surprised when they heard my heavy southern accent! How did we put a wedding together in Italy when neither of us are Italian nor know anyone in Italy? I found this wonderful lady in Texas that planned weddings around the world. We were able to plan the entire wedding by email and phone calls. She arranged for us to go to the American Embassy in Milan and complete the necessary paper work. She would email me pictures of different wedding locations, hotels, flowers ect. . She arranged for a photographer and minister which turned out to be the most difficult. 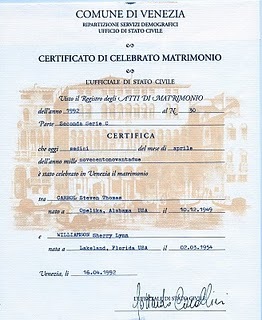 Try finding a officiant that is not Catholic in the town of Venice! We were met in Venice by an interpreter that accompanied us to to complete the paper work and handle any last minute details. Unfortunately the company Weddings Around The World is no longer in business. There was only one glitch in all the planning. The wedding planner neglected to tell us that we would be required to have a civil ceremony prior to the actual ceremony that evening.. We showed up at the government office to complete paper work and we were told we were having our ceremony now. I was married in a navy blue knit skirt and white t-shirt and Hubby wore khakis. We were married by the Mayor of Venice wearing a ribbon of the Italian colors and then he presented me with a dozen peach roses from the city of Venice. 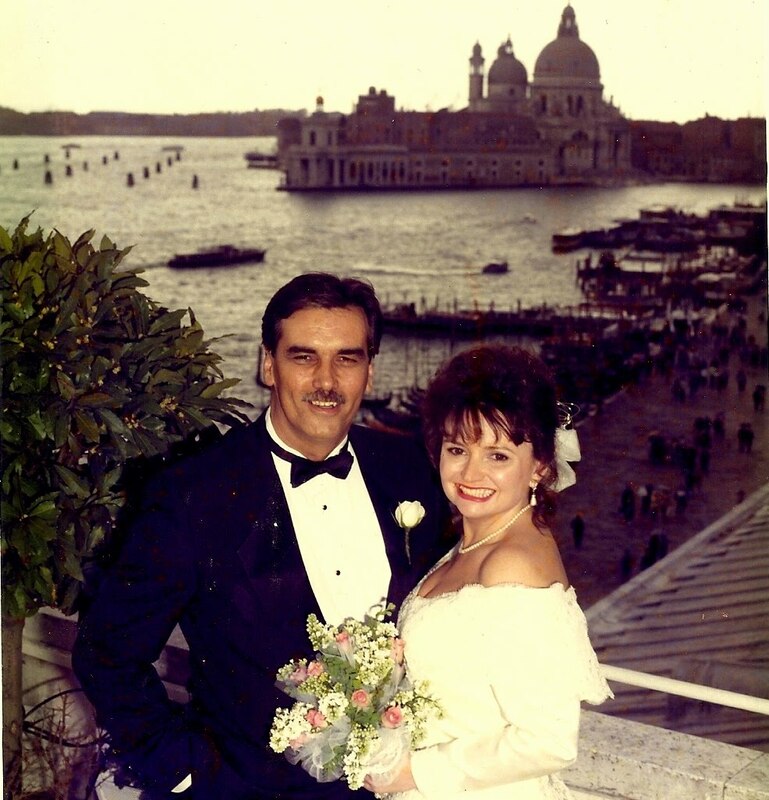 The Mayor told us he thought we were the first American couple to ever be married in Venice. Steve and I have been very fortunate to travel around the world but Venice will always hold a special place in our hearts. Thank you Stephanie at Angelic Accents for hosting the To Have And To Hold Wedding Blog Party and giving me the opportunity to share this special day again. Happy Anniversary! What a beautiful bride. And venice is such a romatic location. Thanks for sharing your lovely memories! What a lovely story! Happy Anniversary! That looks like such a wonderful and romantic place to make such a memory… The pcitures are just wonderful! How fantastic! What a great way to get married. In Europe for some reason, it seems you have to get married in a civil ceremony first. Isn't that strange? Many couple opt not to get married in a formal ceremony afterward. Your photos are gorgeous! You look beautiful (and your dh isn't too bad either). What a wonderful memory and so unique. Happy anniversary to you and your dh! oh wow! what a wonderful story! you look lovely in that gown and crusing along the river is just romantic! thanks for sharing this with us and wishing you a great weekend! My friend, Happy Anniversary to you and your husband!!! Ohh my, how awesome…to be married in Venice! I certainly can't think of a more romantic city! My honey and I, honeymooned there in 2005! We found Venice to be everything and more…than we what we expected! Ohh yes, the island of San Georgio is gorgeous, isn't it? Anyway, I'm just so very happy for the both of you! You were a beautiful bride and your honey, very handsome! Many Congratulations and best wishes!!! Thank you for sharing your special day with us…and it was like taking a trip down memory lane for me as well!!! Happy Anniversary and Congratulations! Your pictures are lovely. What a priceless and wonderful memory for you and your hubby. Thank you for sharing! Such a lovely story, Sherry! What a beautiful city to be married in! Happy Anniversary! May you both have many years of great love and much happiness! Happy Anniversary to you and your husband! I am so glad I found your blog… gave me goose bumps to see all the Italian stuff because my husband and I will be traveling Italy for 2 weeks at the end of May. I came from "New Friend Friday" by The Girl Creative! What great memories – Happy Anniversary! Great photos. I'm your newest follower from New Friend Friday at The Girl Creative. I love you blog. Can't wait to read more. I LOVE your wedding story! Happy Anniversary! My husband and I will be married 17 years tomorrow! 17 on the 17th! I hope yours is great and I love your photos…such a wonderful memory! Congratulations and Happy anniversary! What pretty pictures and what a romantic place to wed. Loved reading how you found the lady in TX to help put your wedding together…what a dream! How beautiful and romantic! Happy anniversary! How sweet and HOW romantic! I think the pictures look wonderful for not being digital! I pray you two have many, many, many, more years of romance! THANK YOU for your sweet words of encouragement for my family…I am blessed! I'm so glad you came over to see me today or I would have missed your wonderful post on your wedding anniverary. How romantic, married in the city of Vienna. What a lovely story and your pictures look great. I thought I was already a follower of your blog but I wasn't, so shame on me. I am now. Wow, to get married in Venice. We have been twice. Once in 2000 with a group and then in 2007 for my son and daughter in law's Italian wedding reception for her side of the family. They got married in Nashville where they live and most of her Italian family did not travel here for the wedding so her parents had a very nice reception over there for them. Your pictures are great even scanned. Marrying in a blue skirt must have had something to do with your being such a happy bride today! I've been to Italy and taken the same gondola ride with my husband; what a treat for a wedding spot! Happy Anniversary and Blue Monday. Fabulous story! The two of you are a lovely couple and the pictures are great. I am so glad you shared this!!! What a very memorable wedding! I would never have thought to do that…but am thrilled for you that you did! Better yet, you are still together and sound very happy! Sherry, what a bella wedding! Happy anniversary to the two of you. Such happy memories to share on your special day. What a gorgeous setting for a wedding. What a lovely couple. I saw your comment at AtticMag and came over to see pictures. Happy Anniversary! What a beautiful couple! That had to be the most romantic wedding and honey moon, it was fabulous looking! Thanks for sharing your beautiful pictures with us! Sherry, Happy Anniversary. What a wonderful wedding to always remember. Loved seeing your photos. It does look incredibly romantic and Italy makes everything better — especially Venezia! Thanks for stopping by — Jane F.
You were a beautiful Bride ! Happy Anniversary to you both ! What a fantastic place for a wedding. We've been to Venice and had a gondola ride, but I don't know how scarry it would have been in that dress!!! Beautiful pictures. What a dreamy place to get married. Lucky girl! Thanks for sharing and Happy Anniversary. What lovely wedding pics and what a wonderful place to be married. I see you made it into the gondola all in one piece, that is such a neat custom. Thanks for sharing and hope you two have a Wonderful Anniversary Celebration. Great story for show and tell. Venice is a magical place. I was able to visit there in 2003 on Fat Tuesday. The place was hopping. It would be fun to be married there. You are a lucky girl. I had to laugh about the gondola ride. I was worried I would fall in as well, but to be wearing a wedding dress & heels, yikes, I would have been a nervous wreck. Thanks for sharing your story & your pics. Happy Anniversary to you and your hubby. I'm stopping by from Friday Follow, Happy Anniversary. I loved your garage sale post too… I can't wait to get out and do some "sailing" of my own. Hmmm, next weekend….. In our area if you don't go early, everything is gone. Nice to meet you, I hope you'll stop by and visit and follow me back. What a beautiful wedding!! Happy Anniversary! Oh my, what a perfect place to have a wedding! And the two of you make a beautiful couple! What an incredible site to get married… and so much before destination weddings were in vogue. Congratulations on many happy years! You were a beautiful bride, Sherry! The wedding pictures and story are so fun! What a great place for a wedding. Aren't you gooing back for a second honeymoon? This is purely gorgeous and amazing!!! 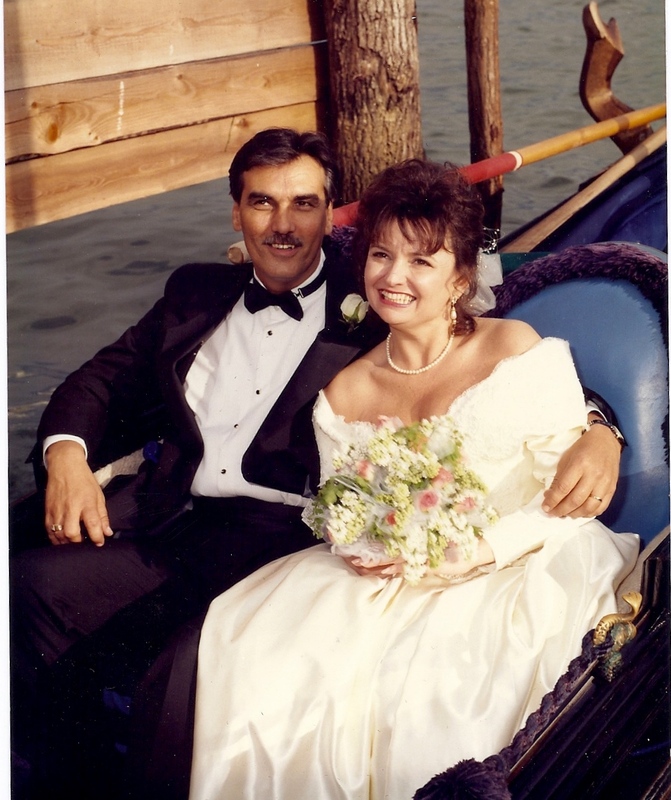 I love how you rode in the gondola–and got married when you didn't know you would–early, that is!! The Lord just wanted you 2 together, that's all–and He couldn't wait!!! Happy Anniversary and thank you for this beautiful post. 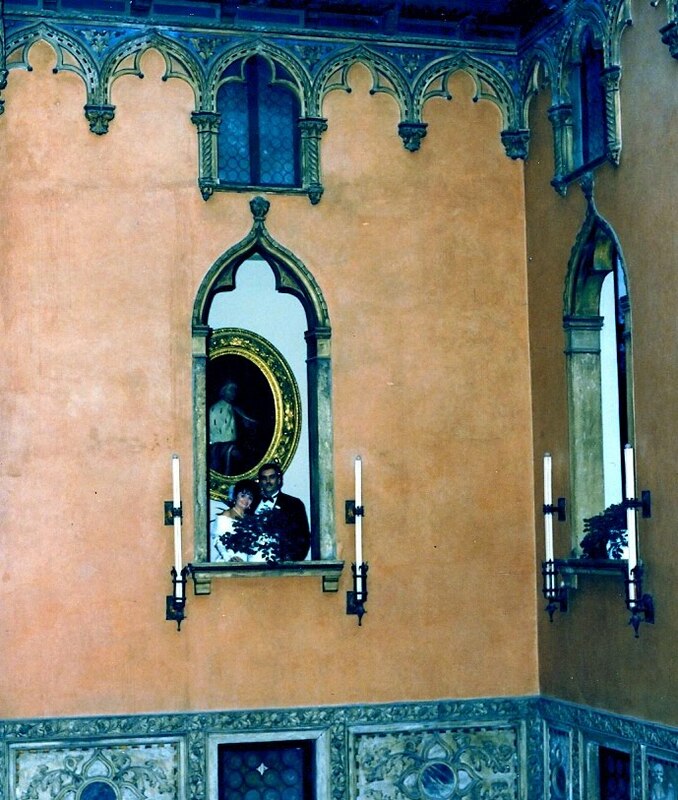 Dear Sherry, I will never ever tire of hearing the romantic story of your Venice wedding. And the pic of you and hubby in the gondola is one of my all-time favorites. Complete happiness is just oozing from you! You know the two of you are such a handsome couple, I bet all the locals thought ya'll were famous!! How fun that they all cheered and waved. I know you will have a fantastic 2nd honeymoon!! 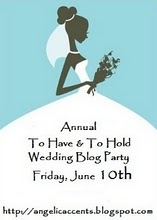 Thanks so much for joining us for the Wedding Blog Party!! What a romantic and beautiful wedding venue! How fun it must have been to hear the crowd join you in celebration. Thanks for sharing. A beautiful and romantic setting for a wedding! Love your dress and bouquet and all the amazing photo's! So wonderful to visit your wedding in Italy again. I remember is so well from our last party and I so enjoyed to visit it again and see your wonderful pics. I hope your second honeymoon is a romantic as the wedding and more so. My grandmother is from Naples, Italy and the counrty is very special to me. I hope to visit one day too. That is one fabulous wedding site! Beautiful!! Sherry, your smile is just beautiful in your wedding photos. How simply wonderful reading this story. I love Italy too. And, my wedding post today is set in an Italian villa on the lake. Come see. It's whimsical, opulent and NOT minimalistic! Happy Anniversary, Sherry! What an exquisite romantic setting for your marriage. Did the gondolier sing to you? What a beautiful bride you were and how wonderful that you are going back for a second honeymoon! In the 70's I went to Venice. It was sooooo romantic! I hope this time is even better than the first! What a lovely story! I bet it was very exciting, romantic and amazing to be married there! How gorgeous! Happy Anniversary. Love the gondola!